Donated household furniture and appliances in clean, working, ready-to-use condition are available to South Lincoln County residents who need them. At no cost. The intention is for families and individuals to have good basic furnishings. Call South Lincoln Resources at 541-563-3710. We will call back! We start with name and phone number and a list of items needed. When items are not immediately available, we will call when each item is ready. Inventory changes weekly. 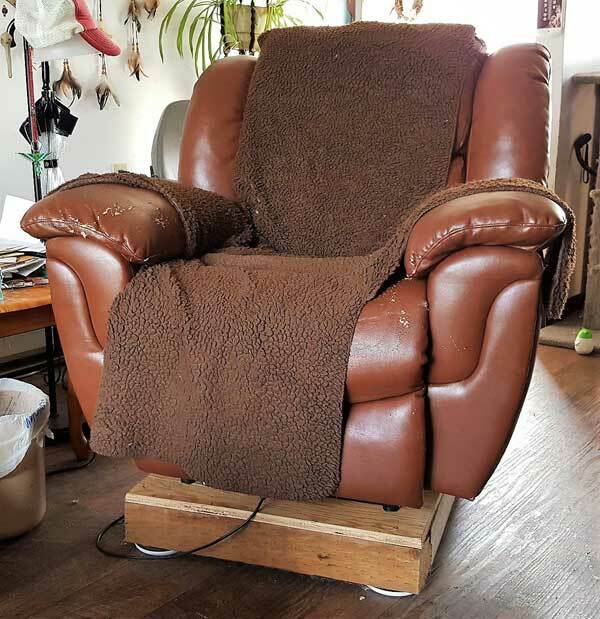 A donated power recliner supplied to a disabled client was too low to the floor, so we built a platform to raise the chair to a comfortable height! See larger photo. To donate or request items, call 541-563-3710. Donations generally accepted Tuesday & Thursday, 1:00 to 3:00pm. For larger items, our Road Crew goes into the community Wednesday mornings by appointment. Call South Lincoln Resources at 541-563-3710 and leave a message that you would like to help. Interested volunteers are invited to attend a monthly board meeting as an introduction to the organization and programs. At the board meeting you can also meet the Food Share and Clothing Share directors who are also SLR members. Looking for a "people person" for our Furniture/Appliance Program. Help move furniture, keep track of what comes in, goes out, client needs for specific items, greet people at the door, and process donations. Must be able to lift 50 lbs and not participate in the program. Work Tues/Thurs 1:00 - 3:30. Move stuff around with the guys and be a 'neighbor helping neighbor'. Call Tonner at 541-563-3710. ** This program closes during November and December; and reopens the first week after New Years.